(Nectarine) Nectarines are a deliciously sweet member of the peach family, but nectarines are not, as some people believe, a cross between a peach and a plum. One nectarine has about 65 calories and provides about one-fifth of the daily requirement of vitamin A. Choose nectarines that are deep yellow to red in color without soft spots. Nectarines will ripen at room temperature. 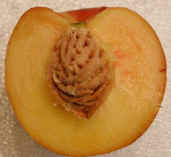 The photo to the left is a nectarine that has been cut in half. 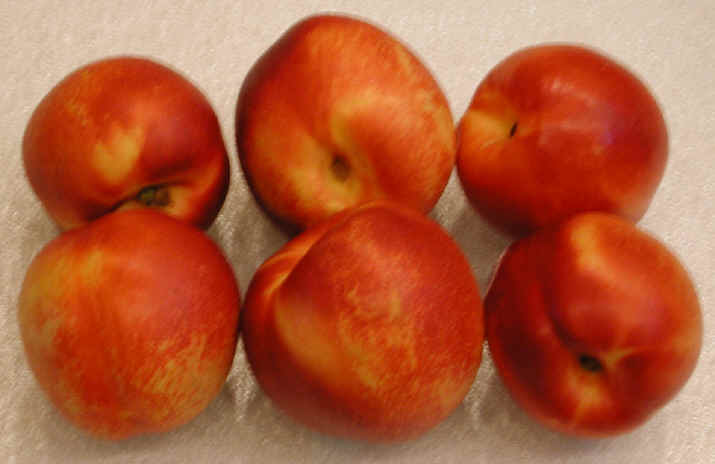 Some ripe nectarines have more reddish colored flesh. 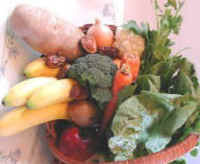 See the nutritional information below.